Direct Marketing Tool. Pageraptor USA, Germany, UK, Canada, Australia, Spain, Sweden, France, Portugal Puerto-Rico, New Zealand, Switzerland, Austria, South Africa, Denmark, Norway, Finland, Luxembourg, Belgium, Holland, and Italy, Argentina, Malaysia, captures data on web pages (yellow, super, etc.) and saves it to Excel. Free for non-commercial use. PageRaptor can then save the data you've selected to Microsoft Excel for future use. ...... PageRaptor is subscription-based. Choose duration and number of credits according to your needs. To see the subscription tariff, please click here. 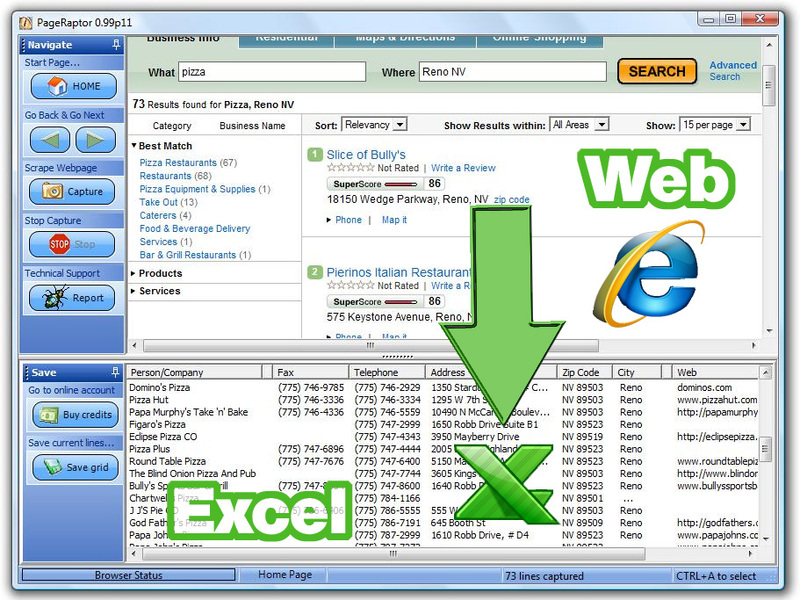 *It captures the names, addresses, emails, phone and fax numbers, web site URLs, of potential prospects on any given page. *It then saves the captured data to Excel (XLS), or Access (CSV). Professional HTML email newsletter software. Qweas is providing links to Pageraptor 1.0.14 as a courtesy, and makes no representations regarding Pageraptor or any other applications or any information related thereto. Any questions, complaints or claims regarding this application Pageraptor 1.0.14 must be directed to the appropriate software vendor. You may click the publisher link of Pageraptor on the top of this page to get more details about the vendor.